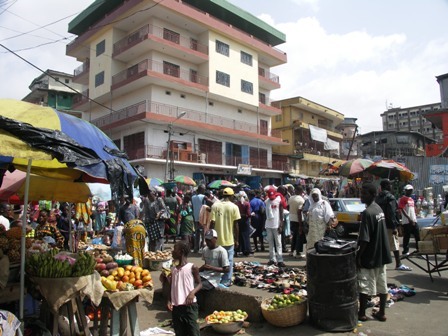 There was pandemonium in the central district of the capital Freetown this evening, when a madman fully dressed in a brightly coloured Ebola protective wear and goggles ran amok, sending market women and shoppers running for their lives. Freetown is tense, and all it takes is the irrational behaviour of one mad individual to bring chaos to the streets of the capital. Ebola is no longer a joking matter. People are dropping like flies; dead bodies lying in the streets uncollected; doctors and nurses working without pay, and without proper protective wear. But a madman was able to get hold of his own personal protective wear, with which he succeeded in scaring the lives out of commuters and shoppers in the streets of Freetown. 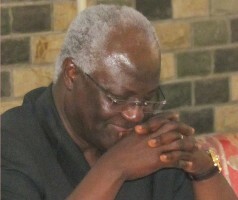 What is happening to Sierra Leone? What is happening to governance? Indeed the whole country is now on a knife edge, as the number of Ebola infected cases rise with alarming speed, especially in the capital Freetown and the northern district of Port Loko. With more than 1,500 people now infected, and over 500 dead – including a long list of medical and health personnel, Freetown is in the grips of fear and panic. 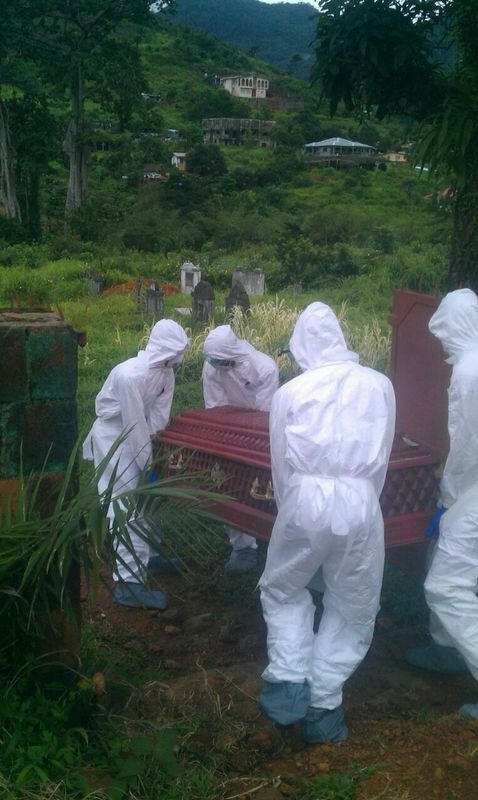 The funeral of Dr. Buck took place today, without the presence of her husband and daughter – now sadly believed also to be infected with the Ebola virus. She was taken to her resting place by a small burial team of four men, dressed in their usual white protective wear. May her soul rest in perfect peace. But many in Sierra Leone and outside will continue to ponder and reflect on the very poor decisions and selfishness of those in power, who denied Dr. Buck the chance to live, so that she will return to what she loved doing best – saving lives. Yet, supporters and paid lackeys of the government have the temerity to blame the international community, especially WHO for failing to evacuate Dr. Buck to Germany. The least said about the president’s begging letter to WHO, the better. 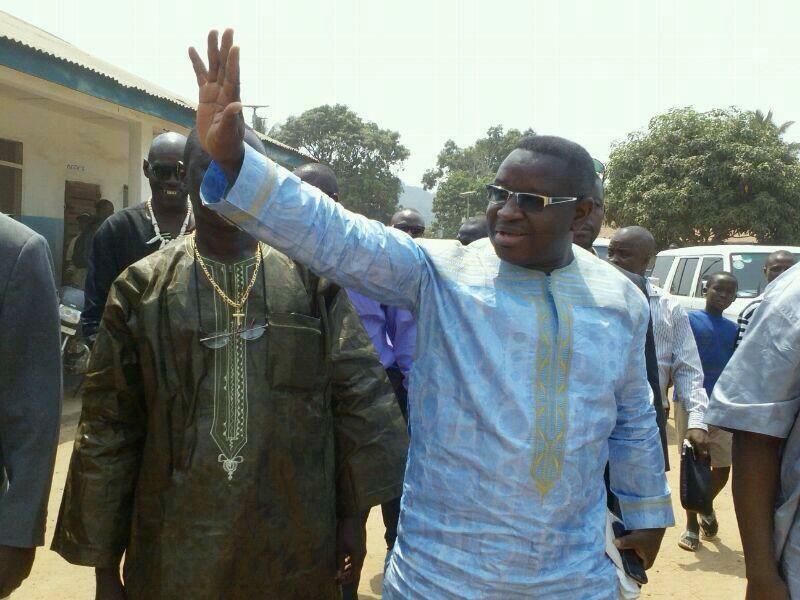 As calls for president Koroma to step down grows louder – amid heightened criticisms of his government’s poor handling of the Ebola crisis, former presidential candidate of the opposition SLPP – Julius Maada Bio (Photo) has written a stern letter to president Koroma. For nearly a month now, I have been in-country to make my own contributions towards the national fight against the Ebola disease. In addition to my donations and establishment of Education Support Fund for Ebola orphans, I have contributed in raising awareness of the disease and in the process, held consultations with members of various District Task Forces and other frontline officials directly involved in the fight against the disease. I now have the pleasure to share with you, Your Excellency, a few concerns and suggestions for your immediate consideration. First, the provision of food to Ebola victims and people in quarantined homes or communities should be considered vital in our fight against the disease. It is no gainsaying that Ebola victims require balanced and nutritious food to strengthen their immune system against the disease. Also, people in quarantined homes and communities need food among other things to survive. There are still reports of inadequate food and/or lateness in the provision of food to the Ebola victims and the quarantined homes. I implore you to pay special attention to the provision and timely distribution of adequate and balanced diets to the Ebola victims and persons held in quarantined homes. Second, I would like to join you to underscore the importance of the contributions of international partners, national institutions and individuals towards eradicating this deadly disease. These, together with the budgetary allocations, are huge resources that would have been used for other development purposes. Recently, there have been negative press reports on the use of resources allocated to various agencies for the fight against the disease. Also, there have been calls by Civil Society Groups for transparency and accountability in the allocation and use of these resources. Your Excellency, I also beseech you to ensure that the resources are allocated and used in a manner that would yield us the optimal benefits. With the limited resources amidst competing needs, I particularly urge that resources are allocated to priority areas and not in a manner that creates controversies and further erode public confidence in the state institutions that are directly involved in managing the these resources. Third, there are reports of misinterpretations of laws and bye-laws relating to the management of this disease. This could be blamed on the fact that there is a slowdown in the sensitisation of the public on the contents of these laws. A very notable case was the recent scuffle between the Sierra Leone Police and the Chairman, Kailahun District Council which led to the alleged unwarranted firing of live bullets by the Police. My sources indicate that the incident occurred because the Police arrested non-commercial motor bikes owned by staff of the Sierra Leone Broadcasting Corporation and the Kailahun District Council on allegation that they were used after 7:00 PM. The alleged unprovoked attack by the Police based on the reports could only be due to lack of understanding on the part of the state security or a deliberate attempt to intimidate the Chairman who has been at the fore-front of this campaign for reasons I cannot fathom. If such action by the police is true, it is unacceptable and should not be allowed to continue. I call for full investigation of this incident and appropriate actions taken against the perpetrators. I also call for continued sensitisation of the population and the security forces on these laws and bye-laws. Fourth, there have been disparities in statistics provided by the Ministry of Health and Sanitation (MOHS) and the World Health Organisation (WHO). Your Excellency, such disparities give the impression of weaknesses in coordination of data collection, consolidation and management. The disparities undermine public confidence in the national response. I would also entreat you to pay particular attention to this area and ensure improved coordination in data collection and harmonization of data released to the public. Fifth, there are still complaints from our health workers. Some of these include incentives to health workers, working gears and training. I am aware of the efforts by the Government and the development partners and would like to encourage you to build on this and sustain these efforts. I would also like to emphasise that you ensure adequate and appropriate working gears are provided to all health workers nationwide. The health workers should be trained in the use and disposal of the working gears. Sixth, there are emerging challenges relating to the process of authorising bereaved families to bury their loved ones and prompt collection of corpses from homes. The challenges include delays in response of the burial teams, inadequate transportation, inadequate number of burial teams and misunderstanding by the relevant officials of this aspect of the bye-laws. The consequences of leaving dead bodies in the streets and in homes have far reaching implications for the spread of the disease. These delays in authorization and collection of corpses are causing tensions between the security forces and the population. Seventh, I am disturbed by the seeming disagreement between the government and a major partner, Medecins Sans Frontier on the planned three-day stay-at-home strategy. The much publicised disagreement obviously gives the impression that all may not be well between government and at least some partners. Your Excellency, it is important that we seek technical advice on all aspects in our fight. Fighting Ebola is largely a health issue and therefore requires professional advice on all aspects including case management, tracing and social mobilisation. I would like to appeal that we avoid such disagreements in future in our fight against the disease to ensure continued international cooperation in this daunting task. • It is important that we are very clear to the public on the objectives of the three-day stay-at-home strategy. The communications team should explain what the public should expect from this strategy and what will be the role of the volunteers. Additionally, the volunteers should be trained and be disciplined enough to carry out their responsibilities. I am aware that efforts are being made in this regard but we need to do more. • Essential utilities such as water supply and electricity should be provided to homes during this period to avoid people moving about in search of such facilities. • The security personnel should be fully briefed on their responsibilities and limitations and entreated to be rational in the discharge of their duties. The leadership of the police should ensure that police do not display excesses at such times but rather carry out their responsibilities with a human face. • During the three-day stay-at-home period, people may fall ill and pregnant women may be ready to deliver. In both instances, people may need to visit health facilities for medical care but may find it difficult to do so since they do not have private vehicle and public transportation will not be available. It is absolutely important that a mechanism is put in place to prevent deaths that may not be caused by Ebola. • The three-day stay-at-home strategy may identify scores of suspects of the Ebola virus. This will surely require immediate reference to the lone laboratory in Kenema, holding centres and possibly treatment centres. It is crucial that adequate provision in terms of clinical wards, staffing and logistics be made to accommodate the possible caseload. Finally, I would like to end by thanking you and our partners, both home and abroad for the efforts in fighting this disease. With continued commitment and proper management, we will surely overcome this terrible disease. This situation has further drawn our attention to the weak health system and we hope, in the immediate future, we will review our health sector to make it more effective for combating disease outbreak. Let me thank you very much for your attention. Ebola – confused dot Com?